Although red salvia blossoms may be red, they are also often pink or even lavender. Red salvia grows as a perennial plant in USDA zones through Zone 4 and as an annual plant in colder zones. 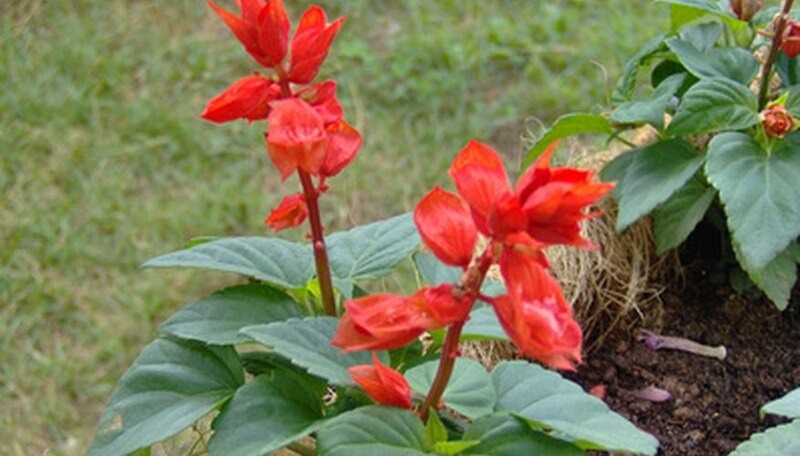 Plant red salvia as border plants, bedding plants or in containers throughout your landscape. With minimal care, these bright flowers will dress up your flower garden throughout the growing season. Prepare a growing area in the spring after the last of the spring frosts. Cultivate the soil down to approximately 4 inches with the garden spade. Sprinkle 2 inches of compost on the top of the soil and work it in with the garden spade. Rake the soil surface smooth prior to planting. Dig holes for the salvia plants with the trowel, making the holes deep enough so the salvia will be at the same depth as it was in the temporary containers. Space the holes between 8 and 12 inches apart (closer spacing will create a carpet of salvias suitable for bedding plants). Remove the salvia plants from the temporary containers carefully. Place the salvia plants into the prepared holes and fill the soil in around the roots of the salvia. Water the salvia plants generously immediately after planting them. Provide water for the salvia plants throughout the growing season if less than 1 inch of rain falls in a one-week period. Water the plants to saturate the soil and then allow the soil to dry slightly before watering again. Fertilize the salvia plants once per month by mixing the fertilizer with water according to package recommendations. Pour the fertilizer around the plants to saturate the soil, taking care not to splash fertilizer onto the plant foliage (to avoid burning the plants). Deadhead the salvias as the blossoms fade to keep the plants looking neat and to encourage continued blossoming. Use the garden shears to clip the blossoms off where they connect with the stems. You can also plant salvias in containers, if you desire. Use containers with a diameter of at least 10 inches and fill the container with standard potting soil. Plant the salvias close together in the container to create a lush and full display. Add potting soil to cover the roots and tamp it down firmly. Keep the soil in the containers evenly moist during the growing season. Fertilize and deadhead the salvias using the same techniques as in steps five and six.